How to take the Paleo Diet to the max for optimal weight loss and total health--from bestselling author and top Paleo expert Dr. Loren Cordain Dr. Loren Cordain's bestselling The Paleo Diet and The Paleo Diet Cookbook have helped hundreds of thousands of people eat for better health and weight loss by following the diet humans were genetically designed to eat: meats, fish, fresh fruits, vegetables, nuts and other foods that mimic the diet of our Paleolithic ancestors. 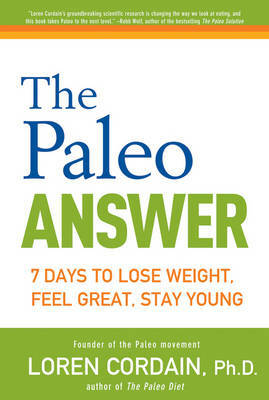 In The Paleo Answer , he shows you how to supercharge the Paleo Diet for optimal lifelong health and weight loss. Featuring a new prescriptive 7-day plan and surprising revelations from the author's original research, this is the most powerful Paleo guide yet. Based on the author's groundbreaking research on Paleolithic diet and lifestyle Includes a new 7-day plan with recommended meals, exercise routines, lifestyle tips, and supplement recommendations Reveals fascinating findings from the author's research over the last decade, such as why vegan and vegetarian diets are not healthy and why dairy, soy products, potatoes, and grains can be harmful to our health Includes health and weight-loss advice for all Paleo dieters--women, men, and people of all ages--and is invaluable for CrossFitters and other athletes Written by Dr. Loren Cordain, the world's leading expert on Paleolithic eating styles internationally regarded as the founder of the Paleo movement Whether you've been following a Paleo-friendly diet and want to take it to the next level or are just discovering the benefits of going Paleo, this book will help you follow the Paleo path to the fullest--for lifelong health, increased energy, better sleep, lower stress and weight loss.